Convert image files into PDF files and PDF files into image files: With the Converter you are able to convert TIFF, JPEG, GIF, BMP, PNG and PSD files into PDF files. You can also convert PDF files into JPEG, GIF, TIFF, BMP and PNG files. Encrypt your PDF Files: Secure your confidential PDF Files. You can set a 128bit secure encryption to secure your PDF Files. You can also set enhanced settings to permit usage of your PDF Files. ...... You can set a 128bit secure encryption to secure your PDF Files. You can also set enhanced settings to permit usage of your PDF Files. 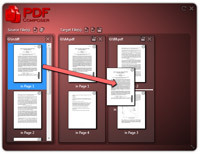 With ReArranger you can change the possition of each single page inside your PDF file. You can also rotate single pages. Split your multipage PDF files into single PDF files. You can also split in batch processes. Just right-click on a file to open it into PDF Composer, split, merge, extract, convert or protect your PDF file. The all in one solution to create, merge, split, arrange and protect PDF Files. With PDF Composer you get the all in one solution to create, merge, split, arrange and protect PDF Files. The user interface is intuitive and self explanatory. You can immediately begin working even without to read a manual. Qweas is providing links to PDF Composer 1.2 as a courtesy, and makes no representations regarding PDF Composer or any other applications or any information related thereto. Any questions, complaints or claims regarding this application PDF Composer 1.2 must be directed to the appropriate software vendor. You may click the publisher link of PDF Composer on the top of this page to get more details about the vendor.